MANILA, Philippines - A former passenger of the Philippine Airlines (PAL) has revealed that thousands of pesos were allegedly stolen from their check-in baggage during a flight from Singapore to the Philippines. Facebook user Jho Cabagyo has decided to air his disappointment against the country’s official carrier on social media after several employees of the airline allegedly failed to address the theft incident properly. According to Cabagyo, they didn’t encounter any problems during their flight. However, when they came to claim their four baggages, they noticed that one of them was missing. It took 10 minutes before their fourth baggage arrived. Upon seeing the baggage, Cabagyo’s girlfriend saw that the baggage’s padlock and zipper had been tampered. “Nung nakita ng GF ko yung maleta, itinuro nya sakin para kunin ko. And with our surprise, wala yung padlock nia. So my instinct tell me to check it. And yes, bukas yung zipper sa loob ng maleta nmin and nawawala yung pera nakalagay dun. We’re not talking about hundreds, but thousands. And even kahit piso siguro why the hell mawawala ang pera kung wala kukuha,” Cabagyo recounted. Immediately after learning that they lost thousands of pesos kept inside the baggage, they sought the help of the airline’s baggage assistance. But to their dismay, the personnel simply told them that they will just make a report about the incident. It was only when Cabagyo threatened to share the incident on social media that the personnel started addressing the issue. They weighed their bags and made a report about the incident. Afterwards, they were told to just wait for a call from the airline’s Claim Department. Not satisfied with the airline’s action, Cabagyo reported the incident to airport police, who showed them a CCTV footage. Unfortunately, the CCTV footage wasn’t able to capture what happened to the baggage. “Gladly the airport police naawa samin, ang check the CCTV. And it shows yun last bag nmin ay naiwan for more than 10 mins at di na abot sa CCTV nila. HAWAK NA daw ng PAL,” Cabagyo wrote. Towards the end of his post, Cabagyo expressed his grievances against the airline. 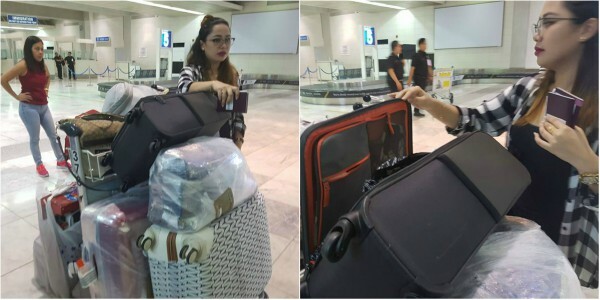 Although many netizens sided with Cabagyo, several orders pointed out that she was at fault for putting money inside the check-in baggage. Passengers are strongly advised not to put valuables, jewelry, cash, electronics and other fragile items inside their checked baggage.